The American image of Alabama during the 1960s could be summed up by two distinct, and seemingly disconnected, images: Birmingham’s Bull Connor targeting hoses against civil rights marchers and Coach Paul W. “Bear” Bryant guiding University of Alabama football to three national championships during the decade. By the end of the 1960s, however, both images had faded. Birmingham solved the worst of its civil rights problems and began to move into the modern era. Alabama football, on the other hand, appeared mired in mediocrity. Back to back 6-5 seasons suggested that Bear Bryant and his program could not adapt to the modern, integrated era of Southeastern Conference (SEC) football. The football program came under attack by its own university when the Afro-American Student Association sued the famous coach and the athletic department for not recruiting black athletes. While this suit was eventually dropped in federal district court, the message was clear. The University of Alabama had to recruit black athletes with the same fervor as white ones. Bryant’s era seemed as dead as that of Bull Connor and the rabid segregationists. The year 1971, however, changed everything in Alabama football. This book examines why the team waned in the late 1960s and how was it revived in the 1970s. 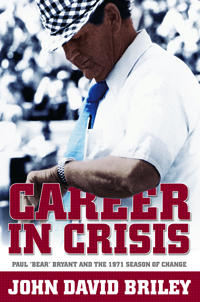 Read within the context of the social and political changes of the Civil Rights Movement, John David Briley’s book is more than a history of a successful team; it also examines in detail, with probing interviews and extant manuscript sources, the internal process of cultural changes at Alabama that helped produce the team’s and the coach’s resurgence. This book is for anyone interested in sports, football, or civil rights.